Welcome to the Future.BIBLE podcast. 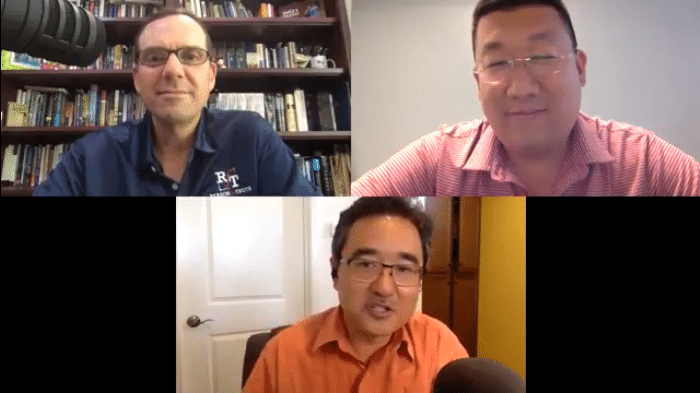 In today’s episode, hosts Kenny Jahng and DJ Chuang interview Steven Garofalo, founder of Reason For Truth, and talk about how the merging of apologetics and technology helped in spreading the truth about God’s Holy Word to over thousands of listeners from all over the world. Discover how having a .BIBLE domain name extension helped Steven and his organization make a stand for the Bible and declare their vision locally and internationally. From a simple change of domain name, listen how it created a huge impact and transformed the lives of believers and even non-believers. KENNY: Welcome friends to the Future.Bible Podcast. I am joined by two gentlemen today that is going to definitely be supercharging our conversations today. I’m with my co-host, DJ Chuang. Welcome to the show DJ. Good to have you on the show today. DJ: Thank you, Kenny. Good to see you and hear you. Kenny: And so we are recording this live over video as well as audio to maximize exposure and reach for our audiences. We have a handsome guest with us, today. DJ, would you mind introducing everybody who we have with us on the show? DJ: Yes. Our special guest for this episode is Steven Garofalo, who is a dynamic speaker and author of two books, “Right for You, But Not for Me; A Response to Moral Relativism” and “All Roads Don’t Lead to Heaven Discovering God in the New Age’, and he is the president of Reason for Truth Ministry and the host of the Reason for Truth podcasts, so he knows how to talk and we’re going to talk with him and he presents powerful and entertaining arguments on the truth of the Christian faith, theology, Bible, apologetics with real life application at churches, high schools and college campuses and of course online. Thank you for joining us, Steven. STEVEN: Thank you for having me, DJ. KENNY: So, the way we have these conversations structured Steven, is that we are trying to get at the intersection of the Bible and technology whether innovators and innovation projects out there applying technology to the Scriptures. And your project is one that has caught our eye and we’re really excited to learn more about it today. And so, we want to hear more from people just like you on this podcast. Projects and teams and entities and organizations working to further Bible access and engagement across the web and beyond. And so, why don’t you start with Reason For Truth, the actual project. How did it start? What was the genesis of it and what urged you to start up this ministry? STEVEN: Okay, Kenny, thank you. I started studying apologetics under Dr Norman Geisler, Southern Evangelical Seminary in 2000. And, so I started an organization called the National Apologetics Training Center, shortly thereafter because there just weren’t any apologetics ministry way back in the day. And then eventually we rebranded it to be Reason For Truth and we still use the National Apologetics Training Center for their formal training. But I think as I get older, I see that people will want the Reason for Truth more than they do just learn about straight apologetics. So, we do both how hence, which we’ll get to, but talking about tying the Bible really deeply into apologetics is the key, but the truth is the truth and God’s Word is the truth. KENNY: Now, tell us a little bit about the content. There’s a lot of content that you are providing through this ministry and the Reason for Truth websites. Who produces all of the content? Where does it come from? Who’s planning it out? And building that strategy for the content. STEVEN: The strategy comes from a host of people mainly our board and some other folks that we work with over the years. I produce almost all of my own content. I use other people’s content. I do interview people for the podcast. We now have a new blog just released about, I don’t know, six weeks ago, eight weeks ago, the Reason For Truth blog on Tumblr and that’s tied in to everything on our podcast, but I do primarily, even though it’s better to have two people on a podcast for my intensive purposes of what I want to accomplish. It’s just me right now in most cases. KENNY: Gotcha. And the topic or the category, so content is apologetics, right? So could, can you share with us, let’s have some shared language and definitions. What is apologetics from your point of view? STEVEN: Apologetics comes from the Greek root apologia, which is to give into defense. And you know, years ago we think about our grandparents or even our parents generation, that God’s word was right. The Bible was the law of the land. Whether you were a Christian or not, you still agreed with the premises of the Bible, and so what we see today is a huge attack on the Bible, and so the Bible itself doesn’t need defending, but in today’s world, we as human beings need to defend the truth of the Bible and the contents of the Bible so that it’s not misconstrued, therefore, creating or removing hindrances, obstacles for people who otherwise may come to Christ and believe in the Bible as the Word of God. KENNY: Now, when I went to seminary at Princeton, we learned that there are different categories of apologetics. I think you would probably subscribe to that same view, right? Structurally, there’s, I think there’s… evidential, there’s the classical view, there is like evidential… There’s a couple different categories. I think a pre-suppositional projects was huge for awhile. Historical apologetics. And given today’s culture and where we are today, is there a specific angle or category of apologetics that has more relevance or contextual, I guess meaning, as we engage with our friends and families and culture? STEVEN: Yeah. I was talking to Kirk Cameron, the actor. Had a big meeting at the ADF and it occurred it’s funny, kind of challenged to be on that. I’m classically trained under Dr Norman Geisler. I do think classical apologetics is in some way, shape or form the best foundation. It just is solid. It’s methodical, systematic. But I do think there is, listen, there’s room for all of the family of apologetics because it’s like a church, right? You have different churches with different, you know, when right here in Charlotte, we have some churches that don’t teach the word of God super hard, but there’s a lot of people that go to that church that gets saved, right? That wouldn’t come to maybe my church. So, I think the same is true of apologetics, but I’m a super fan of the classical apologetics model. I think it’s the most difficult, but I think that at some point that we need to be methodical, systematic. And, there were some classes I will admit that I found fairly useless in seminary, but that’s off the record even though we’re on a podcast, right? But having said that, I’m a fan of the classical, but I believe I see people using the different models very, very effectively. And I think there’s space for everybody. STEVEN: ReasonforTruth.BIBLE, and you know what I love about that, Kenny? It connects apologetics with the Bible. You see what I’ve found, I’ve been in the apologetics world for the better part of 18 years now, and a lot of great people out there. What you see is that apologetics can become this animal in and of itself. And when it does so become too intellectual, it separates from the Bible. So I love the .BIBLE, you know, extension because it’s not, It’s an extension of where we are. Where we need to be. Apologetics is a tool in the toolbox. The Bible’s not a tool in the toolbox. The Bible is the handbook. It is the truth. It is the word of God and apologetics is just a tool to help apply to the Word of God. So when I take a reason for truth and apply these apologetics into .BIBLE, it form a perfect match, a perfect relationship. DJ: Well, what’s amazing about your decision to do that, I think you’re the person that were aware of the first organization Christian Ministry that decided to go from a legacy, a domain name, like a .org, and it switched to a .BIBLE domain name and that’s a pioneering move. Innovative move in a time of many innovations. I mean with any new apps, Uber didn’t exist before. Cellphone, parking lots, airports didn’t exist before. So a lot of new things are coming up. How do you see that fitting in with your ministry and engaging your audience better? STEVEN: Yeah. I think I’m one of the few 50 something which I will give the second number who is a fairly looking ahead and I’m going to confess a DJ working with you and Kenny and Scott has really revolutionized my way of thinking. I was once say this technology stuff’s really working with me, but listen, there’s no such thing as a constant. The only constant is change and by being exposed and using .BIBLE and being exposed to your community and you guys personally, what I’m seek finding is that .BIBLE is really a big chunk of where the future, where everybody’s going. And if you know, that entail some risk. Everybody likes the safe side, but if you want to get ahead, you have to at some point take those risks. And what I can tell you, it’s hard for me DJ to really refute the truth, right? Because some reason for truth and the truth comes down to this. I mean, I literally have thousands upon thousands upon thousands upon thousands and thousands of people that download my podcast every month. Realize half those people are in Saudi Arabia, China, Cambodia, France, Canada, and the list goes way past that. I didn’t expect that to happen. You got to wonder how many people are googling Bible or .BIBLE because it’s a trusted brand and you know, that’s from a sense of God’s directing the footsteps of your mission. That is a, in my opinion, a God thing. That’s the way I see it. Less of a man thing as a man thing gonna to want to stay within his community and for different reasons of exposure or perhaps financial reasons. But, I think that if you really want to reach the world for Christ and do the right thing, I think you got to step out, trust the Bible. .BIBLE is produced by the American Bible Society, It’s trusted name. And so what I found in summary is that, yeah, it has revolutionized the way that I think, and I mean that really has not only where I was, but where I am or where I’m going. DJ: Yeah, it’s great. You have a tech team behind you to take care of all the technical details of which there might be a handful of things. So we won’t put you on the spot and ask you technically how that happens, we’ll ask someone else. But the thing about changing a domain name is not just changing the domain name on the technical side it affects your prints, it affects your banners. Can you run through a couple of those things in the decision making. STEVEN: Yeah, we visit cards, all our banners, we’re about to do a tabletop or a trade show. And so yeah, everything’s pretty much been redone and so, you know, it is what it is. If you do it, you do it, right? So what we, you know, people can still find it to the .org, but it redirects to the .BIBLE. So you know, because we have the trademark on that anyways. But we’ve changed everything and we do find some people who on occasion don’t necessarily, you know, really they’ve never heard of the .BIBLE. And so when they see maybe .org below the .BIBLE, in some cases it helps connect them to where, you know, what it actually is. I found that to be the truth, I think in time to come that won’t be necessary. I think there’s transition to all these new extensions is something that people, people are still, you know, transitioning into that it’s going rapidly, but that’s that. I hope that answered your question. But, I mean, you, you’re brand and you ran all your marketing pieces. STEVEN: For one thing, it definitely creates a sense of clarity because people realize that when you have .BIBLE at the end, that you’re not watery Bible or you wouldn’t use .BIBLE. Right? So the other thing, and for me it is helpful in the sense that when people hear that we’re formally a apologetics ministry, that we are not ashamed to be connected to word Bible and that, not only that, but we very carefully rest on that everything we do leads back to the Bible. I found it gives credibility. One area, Kenny, that I think that this is my hypothesis and I’m starting to see the numbers and tracking come in is I’m starting, I believe that some of our international exposure, which is a wonderful place is coming through the .BIBLE exchange, from all over the world. Because, you know, here in America, I think it’s different. I think when you go to somebody’s closed countries, they really don’t know what they’re looking at because they just, they don’t really know as much. They haven’t had to have an exposure. So if they go to a trust a .BIBLE, I think, I think the world’s a great place and same as to the United States, but I think that’s one area for us, it’s really growing and I, and I kind of attribute that in part two of .BIBLE exchange. DJ: That’s really awesome that your ministry is going worldwide and not without a lot of extra work per se. And so it sounds like the podcast has been a great way for you to get your content and get your message and get your ministry out to audiences worldwide. Since this is called the Future.BIBLE podcast, can you give us a sneak peek into something that you’re working on in the future of how your podcasting and how you’re blogging so that people can be equipped and trained about that you can share, you know? STEVEN: No, that’s fine. I mean podcasting has been, you know, it never stops. You think that, you know, you just get a mic and you go and then, you know, you move to different levels and you know for me, I feel like I’ve arrived where I’m at right now through years and years and years and years of experience. And what I found is that, you know, you have to do what works for you and you have to decide what you want to accomplish. I can tell you this, you guys are doing it right with two people. I could tell you a big part of, I’d love to have two people. It just doesn’t fit my schedule and the way things go. It works in some cases. What I’ve learned from reading a lot of, doing a lot of research on this is that, you know having somebody who doesn’t do the exact same thing that you do, but a little bit different as a great way two different personalities like radio, that’s what you’re doing. You’re basically radio and so I’ll probably suffer a little bit for that, but by the same token, part of my ministry is found in discipling through technology and if I’m going to do that, I don’t, if it comes down to a time issue right now. I don’t have the time to be able to bring another, you know you have to find the right person. It’s not an easy thing to do. KENNY: Absolutely. Now, in terms of demographics, I’d be interested, do you have any information on say what is your, the sweet spot of the age group that is engaging with the content that you’re putting out there? STEVEN: I don’t, because I don’t pay for it yet. It’s expensive to get that right? KENNY: I mean, even anecdotally, if people are emailing, do you have any sense? Because I think one of the biggest, I guess misconceptions is that it’s only the young folks that are engaging in podcasts and everything. But if you look at usage consumption data on all different types of media, it typically is, end to end. You’ve got the seniors as well as the young population actually engaging with technology today. It’s not just this bulge at the lower end of the age spectrum. I’m wondering if you, you’re finding any specific quirkiness or anything that stands out in terms of demographics or how you’re putting out content to relate to one end of the spectrum or the other? STEVEN: Yeah. I tend to speak to people groups and cultures more than I do age demographics. That is, you know, I tend to see the truth is unilateral and I would say if I had a guess estimate, I would say Kenny, that I’m going to guess estimate that that half of my audience probably is 45 to 60 years old. I don’t know, but that’s an easy right and always go 50% but a chunk is. I know that but I think that when you’re talking about how you produce the content, I tend to, you have to pick your content and decide. I have to tell you, I’ve changed a thousand a few times. You got to see what works for you. I mean, you know, this, i know people just constantly do interviews, that’s all they do, you know, and then I’ve read that’s not very good, but if that’s their mission, you have to decide whether you want. I mean when we were with my last host, we were climbing every month, we’re almost at 20,000 downloads a month and growing and I changed platforms and I lost a good bit of that. And then some of that is that you got to watch the algorithms, right? If you know the lesser of the podcast kings will tell you, you’ve got 20,000 downloads when you got 5,000 people that downloaded four times, you know. So, you know, you have to be careful for those using a reputable place that are checking those IP addresses that makes sure that they’re not, you know, that they’re not being misconstrued. KENNY: I guess that is a lesson in any venture entrepreneurial venture out there today is that technology has democratized access to so many different publishing mediums and channels and platforms. But yet at the end of the day, it’s one of those golden rules of life, I think. Right? It’s you get what you pay for and everything is not the same. It’s not binary. It’s not all the same. Right? So I guess you have learned a couple of things that are most entrepreneurs on their pathway have taken them with technology that you have to iterate, iterate, iterate, and always tried to climb that quality ladder as you go. STEVEN: Yeah, absolutely. I’ve learned one thing. I’d rather do three or five things really well and spend the money than do 20 things real cheap because you’re not gonna get anywhere with that. If you do, you’re gonna end up with a false reinforcement. STEVEN: Everyday the surprise with technology you know, it just blows me away. I have to admit I do a lot of things myself. So I’ve learned to take a lot of risks with technology. I’m not talking about like bad risks. I’m just taking, you know, I mean, I just signed up for a blog with Tumblr, you know, and next thing you know, I’ve got a blog. Did I intend to do that? No, did all of a sudden and I found out I do have a blog, I signed up and unbenounced so, you know, that kind of stuff happens all the time. And so the surprises for me a weekly, you know, if you’re growing your ministry, the other thing I found is this, Kenny, unless you have a monstrous, or a good size budget, again, it goes back to just what you said, You have to pick the three or four, four or five things you do well. And I’ve learned that to take what I, what I have and instead of growing, growing, growing, you know, you have to sometimes cut things up. I had an app for years, you know, and you have to decide whether you have, is that useful? And then people started asking what are you doing with the app? Are you maintaining the app? We got rid of it, we did, we took those resources and we did other things with it. And so I’m not saying there’s ain’t nothing wrong with an app. It’d be great. It would probably help us to have the app back but to manage that app is quite substantial. So, we do a lot of other things with it now or a few things but do them much, much better. DJ: That’s really cool. So there’s two parts I’d like to explore with you. So what kind of numbers do you have currently and in terms of your audience size or just roughly like monthly active user I think is a good ballpark for people. And then in the past month or so, what’s one story that comes to mind of a email or a comment that you’ve gotten back that was a real joy to put a face to those numbers to say, Hey, this is working, God’s using this and this technology is really reaching people where they are. DJ: Whichever ones come to mind. STEVEN: Sure. We just started the blog and it is more difficult to track on that I think that you can’t do google analytics with the podcasts were saw the solidly rising past 5,000, but it’s a solid 5,000 and I haven’t checked it but we may be pushing up towards 6,000. And one thing I’m going to say about that DJ is this, you know, I got to the point where I got a little caught up in all the technology a little bit too much. And by that what I mean is you have to manage the technology according to the mission God’s given. You don’t let the technology drive you, you know, would I rather have a 200,000 downloads that are shallow or what? I have 5,000 downloads that are actually discipling people now they’re the 5,000 that are discipled people. I could have, listen, I can have a great show, morning show and do all those things. And I’m not saying you go staunchy right. And so no one listens to you. We have a very strong, you know, download audience and it’s growing, but it’s growing healthy. You know, what goes up memory. There used to be a day where they say what goes up so fast comes down just as fast. And I think that’s an age old analogy or story. But yes, for story there was a great story and there’s lots of them, but one comes to mind because you got understand my books. I’m writing my third book now and the books and the resources are tied into the blog, are tied into the podcasts are tied into the website. So, it’s hard anymore to differentiate between and where something originated from, but I did get a messenger through social media through the website and what it was African American gentleman from California and I happened to have done a piece, believe it or not, on radio, an African American radio station and went to the website. And the gentleman came on and said, you know, I grew up a Christian, he’s a gang member and out in California. And he said, you know, I kind of gave up on Christianity because Christians, and I joined nation of Islam. And I have some podcasts on nation of Islam, but he said, this book sounds like it’s, you know, because it’s, All Roads Don’t Lead to Heaven Discovering God at the New Age. And so here’s a guy who’s living in the new age and he said, I kind of then got this franchise with nation of Islam obviously, because he grew up Christian. Right? So the book there is uses apologetics and it has a call to faith in it, and so, I think it’s great that he got to go back to return to .BIBLE, find the book tied into Radio and you know this guy is not a, he’s a tough guy. So, but that’s great. I mean, that’s where I like to be good. I’d rather be there than in the museum cleaning the dust off the shoulder busts. DJ: Yeah, that’s a great story. And that’s the thing about what we’re doing here in this technology space. It’s not the technology, it’s the people that use the technology and the people that are listeners and viewers on the other side of the technology is a human being with a soul and they have a god shaped void in their heart that needs to hear the word of God. So thank you for doing what you’re doing. KENNY: Yeah, That runs me, Steven. One quote from a guy, I believe his name was Tom Freston and I think he said innovation is taking two things that already exist and then putting together in a new way and I think it’s inspiring to see you taking polishing technology, whether it be tumblr or podcasting in your site and combining with the age old discipline of apologetics and innovating in that way. And so that’s one of those things I think the listeners here today, I think one of the takeaways I think hopefully people are seeing is that when you are putting these two things together, the sum of its intended, someone’s unintended consequences of you being able to reach literally the world wide web globally in countries and displaying apologetics contents in a way that reaches people that you would never have met in your own lifetime, right, personally and that’s what technology is allowing you to do in this ministry. And so, that’s one of the great things that we want to encourage on this podcast, that Future.BIBLE to show that, hey, you can do it. If Steven can do it. You can do it. If you have an idea that you want to take the age old truth of the Bible and combine it with some sort of application of technology. This is the time that we as a culture and society have at our disposal the means to do it. And it’s trailblazers like you appears and leaders that give us the glimpse and hope that we can do that to ourselves. So thank you so much for doing that in your own ministry. Your Reason for Truth is definitely a gift to the kingdom. STEVEN: Thank you. I appreciate it, Kenny and DJ and I tell you, I really want a transformation. The Internet is… one of my board members says, you know, unfortunately, we often have to do shameless self promotion. In the Bible teaches us to be humble. And it tore up my soul until I finally melded the two exactly. You just nailed it, man. When I finally took the two and I said, hold on a second you have to, you have to promote. I don’t promote Steven Garofalo, I promote Reason for Truth and Steven Garofalo’s a big part of that. One day I’ll leave this earth and I’m not going to leave with anything except for the impact for the God called me to do and as much as it’s obedient. And so what I did as soon as I came to the conclusion that conclusion, this whole .BIBLE has helped, It’s given me that I ever told Scott this, but it’s given me a great deal of peace because I just don’t feel this. I should say I want to be careful when I use my words, but this sense of running this race with other people and it’s about what God opens up. And so, you know, look forward. Technology gives you the world at your fingerprints, your fingertips and you know, that has given me taken a lot of pressure off me. It’s put a little pressure on me in the sense that when you are doing ministry that you want to focus down and make sure that you’re reaching your audience and then you’re delivering God’s word to them and teaching them and fulfilling your mission, but you know, in the world of ministry and apologetics, unfortunately especially there’s this selfish ambition. You see that in everything. We’re all human beings. We’re all sinners. I get that. I just found that this whole venture has really given me a peace because it’s allowed me to reach the world in a way that a guy leave it in God’s hands. So we’re reaching the world. And Glory be to God. Thank you God. Thank you guys for what you do. KENNY: Thanks to you for being with us today. As we close the show, if someone listening in today wants to get in touch with you directly, can you share your details with us, your website address or contact information? How can someone contact you directly? DJ: And we’ll add all those things in the show notes so people can also find it at future .BIBLE. KENNY: Thank you very much for listening to this episode of Future.BIBLE. For resources materials, head over again to www.future.bible. If you love this episode, would you do us a favor and head on over to ITunes, Stitcher Radio, Google play where you’re downloading and listening to this podcast, subscribe, rate, and leave a review. It’s very much appreciated. Thank you. Take care and catch you here next time on Future.BIBLE.